Email marketing is not a simple thing, it is huge. It is the best way to find more customers, make more sales and you can increase your followers. Now only vast business is accepting but also small business should have Email marketing strategy but many people ignore it and losing many opportunities. Whether you may have your owned website for small business, online shop, and blog, Email is the best way to retain your current customers. As well as Email marketing is one of the best ways to convert your visitor to customers. People think many best social media websites are available on the internet. It has a very digital look, therefore, email has not much value against other social media. But this is too far from the truth. Every Email Marketer should have the email list to send the links to them. If you have not listed of email, first you need to assemble active email. For creating an email list you need to do efforts, after some effort, you can grow your email list. 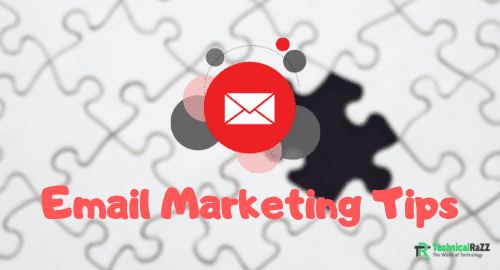 After that these tips will help you in Email marketing. This is the first and very important tip. You need to make too easy to do registration on your website. No need to ask more information in the registration form, only name, and email is enough. The registration form should not be able to create confusion. Try to make it only one click registration. People should only need to enter their name and email and then only need to click on the Register button. Once they activate the confirmation through their email, they are on your list. If you want to make registration more systematic you can allow visitors to register by using their social media accounts. You will not only assemble their email but also you connect with them at social media. 2. Why will people register on your list? Why should people give you their email address, how it will be beneficial for them? You are not able to grab their email address without some benefit for them, you need to provide them free ebooks or any other thing. Make sure their benefit for registration should be shown at the time of registration. The location of your email registration box will affect the people to register your email list. Top right sidebar- If you want to add the registration box on sidebar this location is best for you. Bottom of the article- You can show the registration box permanently or you can add auto hide type. If someone read your article till the end, he will also see the email registration box. Footer- Footer is the other good location to add the box. Footer is the best location to add the shopping article. Home Page Top- Many famous and popular marketers use this location. This is like a professional location to add the email registration box. Now you need to set your schedule to publish the posts. Your reader needs to know about your schedule (every day, Every week, etc.) and your information type (technology, coupon, offers, etc.). You need to become honest with your readers. Try to avoid promise them because sometimes you are not able to complete the promise. This will affect your email registration. You need to make the registration process easier and try to inform readers what’s going on in each registration steps. For example, if any reader is entering his name the first time, therefore, you should tell him that he needs to confirm their email address. Spend some time to customize the message and this message should go each your reader who is registering to your blog. The message should blow the readers mind. Every marketer knows that the website is not one platform to get email subscriptions, Social media can prove as the best promoting platform. The number of active people on social media is higher than the particular website, therefore, you can get more emails from social media. Feel free to ask your social media followers to join your email list but don’t forget to explain the benefits of joining your email list. Email is the best way to get more visitors to your website but when running email marketing to increase the sales, your first objective should be to generate more conversions and no more visitors. For example, you are selling any paid course, therefore, you are running an email marketing campaign. For that, you have to use the list from your blog. In the sending email, make sure the recipient can read all the information regarding your course. The recipient should go directly to your website for purchasing purpose only. The above points show the two things, the first thing is you have to customize the emails mobile friendly and the second thing is you need to have the strategy for mobile emails. From today make sure your all email should be mobile friendly. You can use the different emulators to see the view of your email in different devices. Let assume that you are running SEO campaign or social media marketing or email marketing there are too many ways to understand your mistakes like getting feedback from readers. You need to monitor your results. Ask people to understand your mistakes and correct them immediately. You can run the advice contest, on your website and email add the option by which the people will give you the advice about your service. You need to register on your competitor email list, therefore, you will get the new update of your competitor. Which techniques are they using? Observe their email type. Your aim is not to copy your competitor's tactics, but you are doing this for keeping yourself always ahead. You need to understand some basic concepts of marketing strategies. Remember this content marketing is not similar to social media marketing and not similar to email marketing. Mainly content marketing strategy need for email marketing. Now you need to plan what type of content you want to send out in your email. Make sure your content has purpose and meaning also. Now you need to see the email marketing strategies of big e-marketing companies like Amazon. First of all register on Amazon website. Now see what techniques they are using email marketing strategies. Once you see a product on Amazon you will receive the email with similar product suggestions and if you bought a product you will receive the email with more products to buy. The only person can not do this but you can give the best service to your email list. I have already told you the social media is the best way to grow an email list. In one way you can use emails to grow your social media profiles. The simplest and effective way is to use the social media button in your email so that your subscriber can connect with you in a different social medium. Remember, if you are sending the bulk email to people, you need to do best and standard practices on customization of your email. Otherwise, you will be considered as the spammer. Many people do the mistake to send emails without any services. There are many services are available on the internet. Many people use Gmail or outlook to send emails. This is not a professional way. The services of this type protect you from your mistakes, therefore, it is important to use the pro service. Many service companies have a free package plan for small business. Here is about 3 billions of email account in the world. Every person has an email account who active on internet and email is one of the best ways to contact and keep engaged with the customers. Every business must have an email marketing strategy and take advantage of it.